Of late, I've been receiving lots of comments complimenting my easy to-do recipes. Many readers of mine thanked me for posting easy peasy dishes, which helped them alot in cooking despite their busiest schedule. Some even asked how do I come up with easy recipes. Some say I helped to boost their interest in cooking. Remember, I do constant trials...with passes and many failures! In a pot, bring to boil milk, agar-agar powder and sugar until dissolved. Stir constantly. Add heavy cream and chocolate paste. Continue stirring for 3 minutes. Pour the mixture into moulds. Cool at room temperature first and chill in refrigerator until set. a) Use Strawberry flavoured milk and add strawberry paste. Or any other flavoured milk. b) Put only 5gm agar-agar powder if you prefer the scoop type soft pudding. c) Make a layered pudding using flavoured milk and fresh milk. 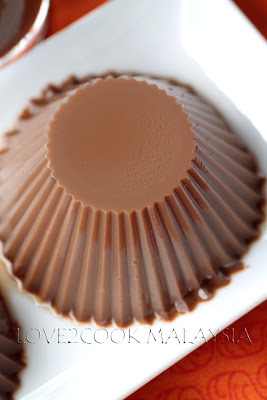 OMG this is such an absolute treat yumm n perfect love to make this at home..
Oh dear this looks so irresistible1 and is making me drool here... Super duper recipe..
Hi love,wow,nmpak yummy,walaupon simple ajer..Tambah2 ada coklat2,mmg feberet..
your chocolate pudding made me drool!! !cannot tahan ..masuk listlah.. I seldom make pudding or dessert for my family, too busy baking cake and bread, hehehe.. Look like i need to do this for them because it look so yummy! Is that it? So simple and loving the clicks. Bookmarked dear. 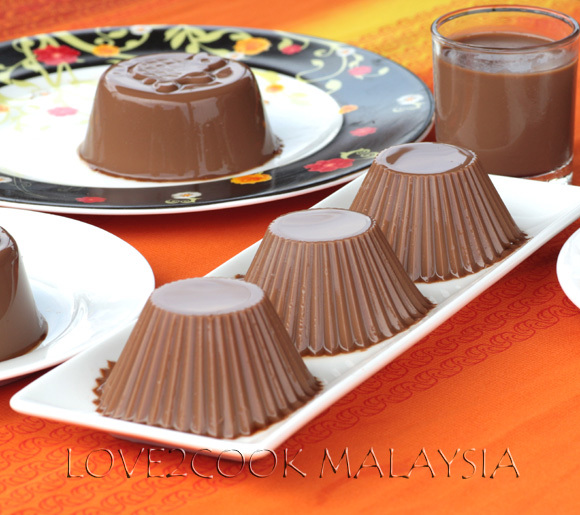 Hi Love...K.atie singgah nk mintak puding coklat tue,nampak menyelerakn!Tambah klu baru keluar dr esbox..yummy..
Oh my...!!!! This is sp gorgeous, sinful & choco delight!!! Whoo ~ what a treat! Sinful n chocolaty, YUM! lovely n superb clicks that makes me drool.....looks yummy!! 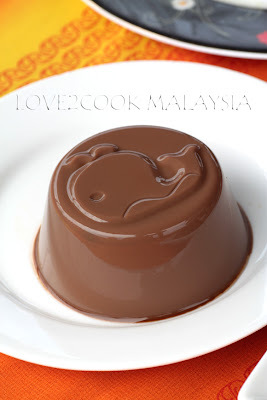 hi love, sedap nya nampak puding ni.. ita suka yang coklat2 ni.. nant nak try la.. Wonderful recipe! Fast and tasty! Love it! Looks so elegant and sounds absolutely DIVINE!! Very tasty very easy something I can make. Bookmarked for later use. very delicious loved the look of it ..Yum! Thats really droolworthy.. Quick and easy too.. This is really simple. will sure make this for my family. 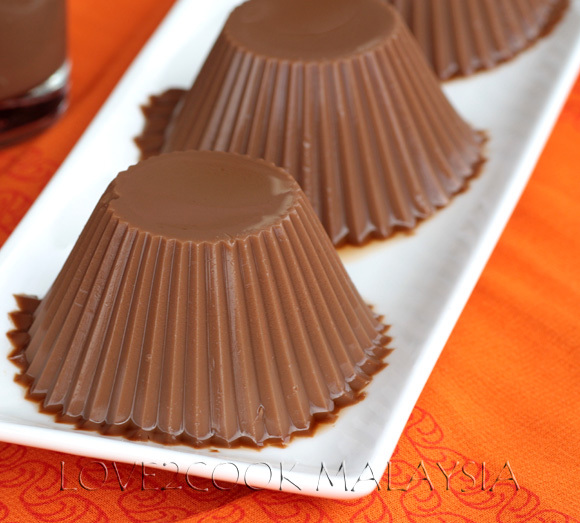 my kids love chocolate jelly very much! 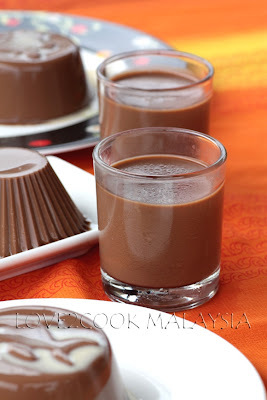 normally i use chocolate powder for hot chocolate kalau buat jelly choc...nway apa2 perisa coklat mmg best! betul tu love.. i pun suke dishes yang simple to prepare but yet delicious ..kadang2 add a simple rempah je boleh bagi sesuatu rasa yang lain kan. tapi masakan love memang ada kelainan bila ada sentuhan dari campuran bangsa.. memang suke..love.. i kan..memang try banyak jugak resepi u, tapi kalau lauk pauk ni, jarang dapat snap. 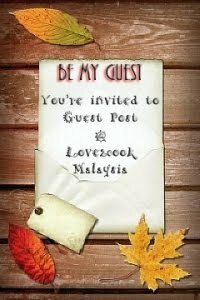 sebab hubby suke makan panas2, so letak je atas meja, hmm dah tak sempat nak kuar kan kamere bagai.. hehehe.. nyummyy!!!!!!!!! skrg ni selalu panas, dpt mkn puding sejuk2 ni mmg sedap. indeed inviting and mouth watering...no one can resist chocolate..
Wowwwwwwwwwwwwwwww.. looks so tempting and perfect.. mouth watering shots.. Yummy !! I'm very much inspired by you too! 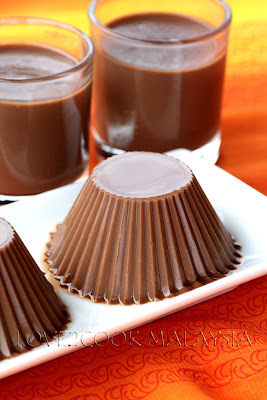 This chocolate milk pudding looks very yummy and pretty :) Thanks for sharing. 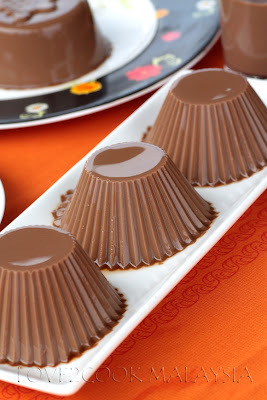 Elegant and irresistible pudding,feel like having rite now..
Divine is the word! Wow! ohh my gosh.....so delicious...your family is very lucky that they have such a great cook!! Pudding is already sound good to me, with chocolate some more ... any more left? Looks so yummy good! am drooling here..mouth watering pudding..
Looks damn good and it has set very nicely! Loved it! OMG this is such an absolute treat and looks professionally done.. They look really nice, excellent photo, and easy recipe indeed. Easy recipe with great clicks. Wow u do make everything sound and look simple,yet great!